Anger is another issue that raises many health complications. You must learn how to control your anger; otherwise, you put yourself in so many dangerous situations. MedHouseCall is a healthcare organization that talks about general health that people are commonly suffering from. We take care of people by offering home call doctor services to patients in Ontario, Canada. For your any health needs, contact us. Our best doctor will visit your house and carry out the necessary treatment. Our doctors are also offering tips through healthcare blogs so that people can take necessary precautions when it comes to their health. Here, we talk about anger and you can you control them. When do you feel angry? We know that when things do not go according to you, it makes you irritated and angry. This spoils your time and you may also take major decisions in a wrong way. 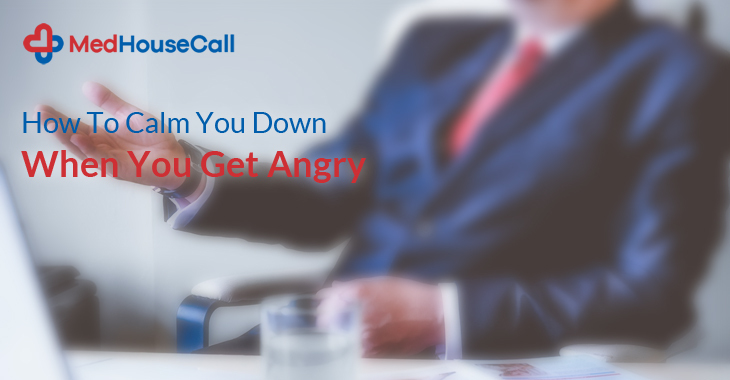 If you are suffering from this problem, we are offering you the best anger management ways. While meditation will help you reduce your anger level and helps you cool down in a disturbing situation, some easy tricks will give you instant relief. Use our on-call doctor Ontario service and get yourself treated easily. Go away from the situation that makes you feel angry and irritated. Go for a walk and focus your attention on nature. If you are into the heated conversation, going for a walk is the best option that you have. There is a thing called ‘heat of the moment’ that describes – you have done something wrong for your anger and you are regretting for this. So, you must control your first impulse and you need to think about the effect of your thought. Don’t give in to your anger. Deep breathing exercise is a very good option for controlling your anger. Breathe in through your nose with counting 6 and then slowly breathe out with counting 8 and 9. Repeat it 10 times. When you get angry, you can start counting backward from fifty. It diverts your concentration and makes you feel good. If you still feel angry, make the counting start from 100. We heard about music therapy and it really works. Listen to some soothing songs and let the anger cool down. It calms you when you feel angry and agitated. You must think positively to handle a situation. When you can think that you are strong enough to handle anything, your anger goes down. So, these are some tricks that you must know to control your anger. For any medical help, MedHouseCall is always there. Call us anytime and our doctors visit your place for treatment. We are offering On Call Doctor service in Ontario, Canada to make the health care facilities easily accessible.